For the past several years, Julie Spira’s been writing about and quoted in articles on the collision of politics and love due to Donald Trump’s presidency. This topic is timely and so divisive that her interview in the Sacramento Bee on dating and politics resulted in Sean Hannity complaining about it on his show after Spira stated singles were swiping left on mobile apps and didn’t want to date Trump supporters. 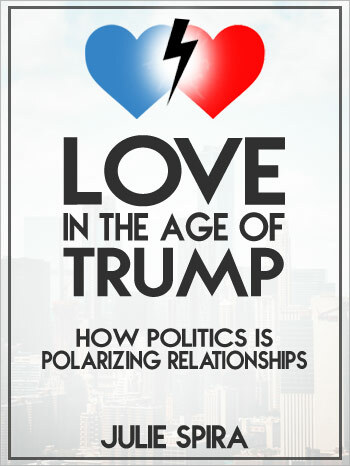 Love in the Age of Trump: How Politics is Polarizing Relationships is a view through the lens of an internationally-recognized and award-winning dating coach where ironically, her own love life got put to the test during the presidential campaign. Spira takes a deep dive into why Donald Trump has caused so much turmoil to those who lean left, right, or somewhere in between. She’s been collecting personal stories of singles whose relationships ended or were adversely affected due to opposing political differences in the Trump era. Spira’s analyzed and gathered data from studies and dating sites on the subject, interviewed political commentators, relationship experts, and sociologists on how the great political divide is crushing relationships. Love in the Age of Trump provides advice on how to date across party lines with the goal of having love flourish once again.